SPARKS, Okla. – Clouds of dust belched from the corners of almost every room in Joe Reneau’s house as the biggest earthquake in Oklahoma history rocked the two-story building. But the weekend earthquakes were among the strongest yet in a state that has seen a dramatic, unexplained increase in seismic activity. 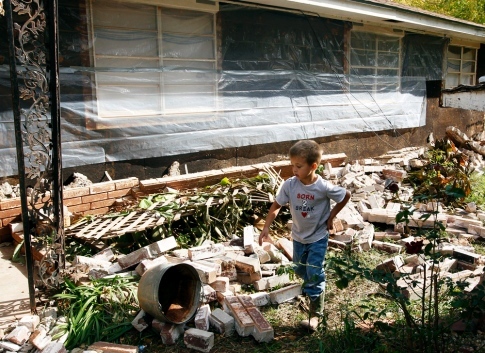 Oklahoma typically had about 50 earthquakes a year until 2009. Then the number spiked, and 1,047 quakes shook the state last year, prompting researchers to install seismographs in the area. Still, most of the earthquakes have been small. Richards estimated it lasted for as much as a minute. One of his wife’s cookie jars fell on the floor and shattered, and pictures hanging in their living room were knocked askew. Geologists now believe a magnitude 4.7 earthquake Saturday morning was a foreshock to the bigger one that followed that night. They recorded at least 10 aftershocks by midmorning Sunday and expected more. Two of the aftershocks, at 4 a.m. and 9 a.m., were big, magnitude 4.0. Brad Collins, the spokesman for St. Gregory’s University in Shawnee, said one of the four towers on its “castle-looking” administration building collapsed in the big earthquake and the other three towers were damaged. He estimated the towers were about 25 feet tall. Scientists are puzzled by the recent seismic activity. It appeared the latest quake occurred on the Wilzetta fault, but researchers may never know for sure. Earthquakes that hit east of the Rocky Mountains are harder to pinpoint because the fault systems are not as well studied as major faults like the San Andreas in California. Arkansas also has seen a big increase in earthquake activity, which residents have blamed on injection wells. Natural gas companies engaged in hydraulic fracturing, or fracking, use fluid to break apart shale and rock to release natural gas. Injection wells then dispose of the fluid by injecting it back into the ground. There are 181 injection wells in the Oklahoma county where most of the weekend earthquakes happened, said Matt Skinner, spokesman for the Oklahoma Corporation Commission, which oversees oil and gas production in the state and intrastate transportation pipelines. But natural gas companies claim there is no proof of a connection between injection wells and earthquakes, and a study released earlier this year by an Oklahoma Geological Survey seismologist seems to back that up. It found most of the state’s seismic activity didn’t appear to be tied to the wells, although more investigation was needed. “It’s a real mystery,” seismologist Austin Holland of the Oklahoma Geological Survey said of the recent shaking. “At this point, there’s no reason to think that the earthquakes would be caused by anything other than natural” shifts in the Earth’s crust, Holland said. Earle said he couldn’t comment on the relationship between fracking, injection wells and earthquakes. Most Oklahoma residents still see earthquakes as anomalies in a state more often damaged by tornadoes. Roger Baker, 52, laughed at the idea of buying earthquake insurance, although the weekend quakes left a 6-foot-long crack several inches deep his yard in Sparks. “It’s just a part of life,” he said. Prague resident Mark Treat, 52, was at the Dollar General store Sunday, buying paper towels in bulk, garbage bins and a broom and mop to begin cleaning up his home. He said the quake hit hard enough to knock dishes, lamps and a TV to the ground and overturn a chest of drawers. And His voice shook the earth then, but now He has promised, saying, “YET ONCE MORE I WILL SHAKE NOT ONLY THE EARTH, BUT ALSO THE HEAVEN.” This expression, “Yet once more,” denotes the removing of those things which can be shaken, as of created things, so that those things which cannot be shaken may remain. Therefore, since we receive a kingdom which cannot be shaken, let us show gratitude, by which we may offer to God an acceptable service with reverence and awe; for our God is a consuming fire.